What is the most common injury to a welder? Burns and eye injuries are the most common injuries to welders due to sparks landing on the skin or in the eyes. Infrared and ultraviolet radiation are also sources of eye injuries and burns. Infrared radiation can cause retinal burning and cataracts. IR is usually felt as heat. Ultraviolet radiation cannot be felt as heat, but can cause an eye burn known as “Welder’s Flash.” Welding arcs are very intense and can cause burns to skin and eyes with just a few minutes of exposure. Even brief exposure to UV radiation can result in “Welder’s Flash” but it may not be felt until several hours after the exposure. It causes extreme discomfort, with swelling, fluid excretion from the eyes, and can even cause temporary blindness. Repeated exposure to UV radiation can cause permanent damage to eyes. What compounds are found in common welding fume? The most common compounds in fumes from arc welding of mild steel are iron, manganese and silicon although other compounds in the electrode or on the base metal may be in the welding fume. Fumes from stainless steel and hardfacing products contain chromium or nickel. Zinc in welding fume usually comes from welding on galvanized steel. Some welders have developed asthma from exposure to these metals and some forms of these metals are known or suspected to cause lung cancer. Manganese overexposure may affect the central nervous system, resulting in poor coordination, difficulty in speaking and tremor of arms or legs. This condition is considered irreversible. Overexposure to zinc may cause fume fever with symptoms similar to the common flu. Precautions must be taken to keep exposures as low as possible. 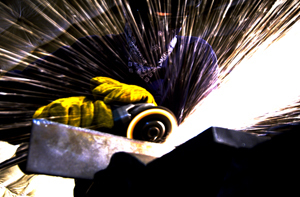 For more information about chemical hazards and radiation/light hazards in welding see OSHA Welding Health Hazards. When is a stick electrode “electrically hot”? A stick electrode is always “electrically hot” when the welder is on. How do you protect yourself from electric shock when welding? Insulate your body from the metal you are welding. Do not rest your body, arms, or legs on the work piece (the metal being welded. Use plywood, rubber mats or some other dry insulation to stand or lie upon. Wear dry gloves in good condition when welding. Do not touch the electrode or metal parts of the electrode holder with skin or wet clothing. What protective clothing is needed in arc welding? Protective clothing needed for welding includes general fire resistant clothing, safety glasses, shoes, gloves, helmet and leathers. Is it necessary to wear safety glasses if you are already wearing a welding helmet? Even when wearing a helmet, ANSI Z87.1 approved safety glasses with side shields, or goggles, should always be worn to protect your eyes from flying particles. Can oxy-fuel tinted goggles be used to protect your eyes while arc welding? Oxy-fuel goggles do not protect your eyes from the intense ultraviolet (UV) radiation produced by the welding arc. A welding helmet with the proper shaded lens must be used whenever welding. What are steps that you can take to prevent hot sparks from being trapped in your clothing? Avoid rolling up your sleeves or pant cuffs, because sparks or hot metal could deposit in the folds. Also, wear your pants outside your work boots, not tucked in, to keep particles from falling into your boots. What types of gloves are suitable for protecting your hands while welding? Heavy, flame-resistant gloves from materials such as leather should always be worn to protect your hands and wrists from burns, cuts and scratches. As long as they are dry and in good condition, they will offer some insulation against electric shock. When does OSHA consider natural ventilation sufficient? The room or welding area contains at least 10,000 cubic feet (about 22′ x 22′ x 22′) for each welder. Cross ventilation is not blocked by partitions, equipment or other structural barriers. Regardless of whether the ventilation meets these requirements, the welder’s exposure must be controlled to below the permissible exposure levels (PEL) or threshold limit values (TLV) to be adequate. If you didn’t fare well from this welding safety quiz, it might be time for a Construction Outreach Training Course from the industry’s top OSHA Approved Trainers.